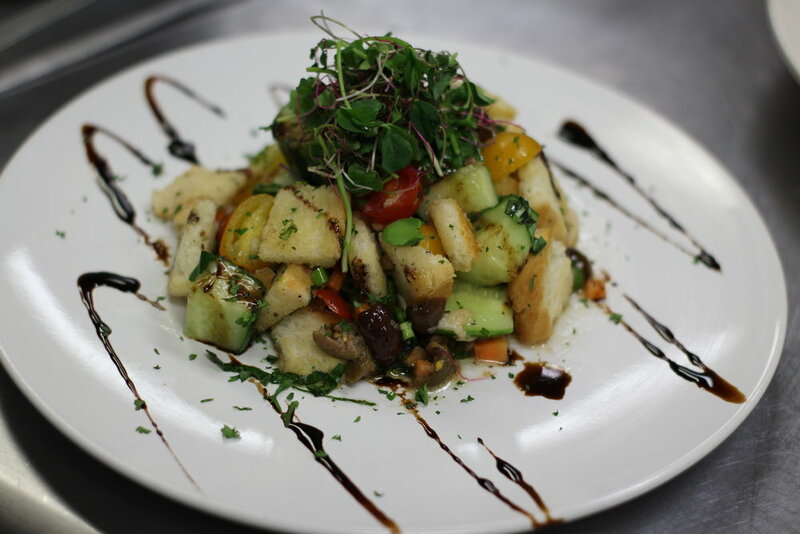 Vegan restaurant located in Salt Lake City, serving classically inspired gourmet plant based comfort food. Eclectic wine and local beer list. Enjoy a relaxing dinner before your next show downtown! Seasons is a relaxed eatery, serving cuisine crafted by classic culinary techniques fused together with new age plant based creations, offering French and Italian as the mainstay. 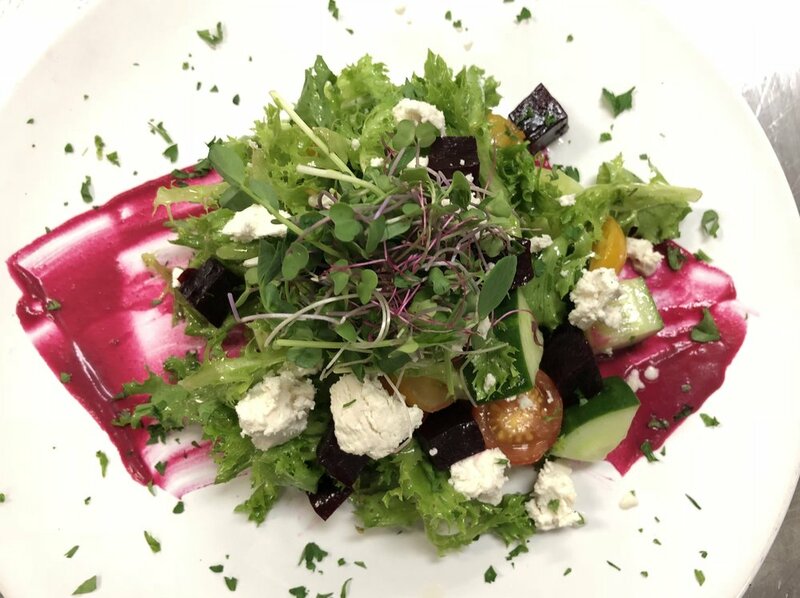 Our focus is creating a beautiful sustainable food experience that respects nature and nourishes life. 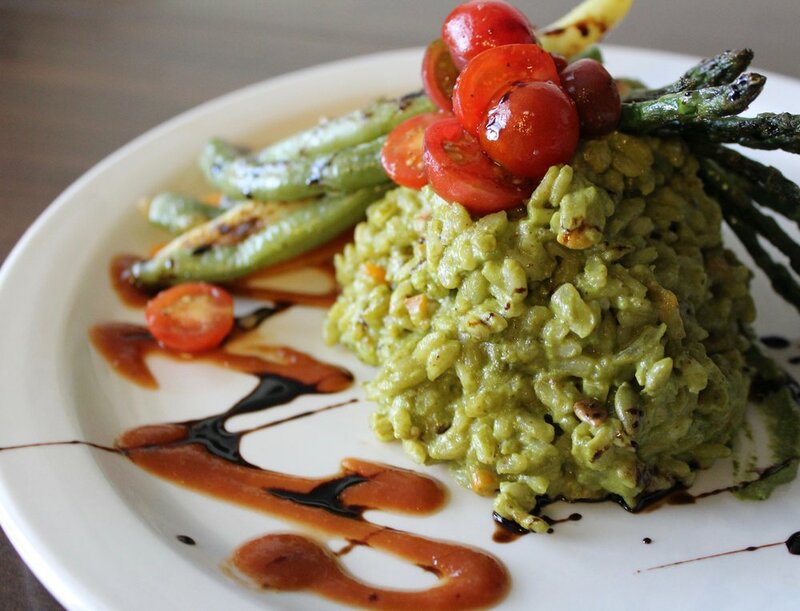 We strive to always use local, regional, organic, and non-gmo sourced foods that are hearty, healthy, and delicious! Our mission is to let everyone experience how amazing plant based whole foods can be. Sit back with a glass of wine from our hand selected list, or celebrate with one of our hand crafted desserts. Conveniently located only a little over a mile south of downtown. Salt Lake's transportation system TRAX has a stop at 1300 S. Ballpark which is 3 blocks away. Please do not park in the lot north of the restaurant. There is plenty of free parking all along State Street. We currently do not offer delivery services. Crispy risotto balls stuffed with fresh in-house mozzarella, fresh herbs, pomodoro and crème. Portobello mushroom skewers smoked in-house, bordelaise sauce, seasonal greens, infused oil, tomatoes, scallions. Fresh In-house flatbread pizza dough, roasted garlic creme, mushroom bacon, spinach, caramelized onions, parmesan, infused oil, basil. In-house cultured and smoked brie, in-house almond and herb rolled boursin, in-house compote, local bread, prepared vegetables. Seasonal lettuce, caesar dressing, soft toasted croutons, brown olives, fresh grated parmesan. Ice berg lettuce, bleu cheese dressing, tomato, mushroom bacon, green onion,. Toasted local bread, garlic infused oil, fresh herbs, parmesan. Sautéed with onion, garlic, herbs, wine and miso glaze, infused oil. Garlic whipped mashed potatoes, green onion, crispy onions, mushroom bacon. Fresh in-house cavatelli pasta, creamy tomato sauce, fennel sausage, parmesan, basil. Fresh in-house spaghetti pasta, white wine butter sauce, pomodoro, breaded tofu filet, creme, parmesan, basil. 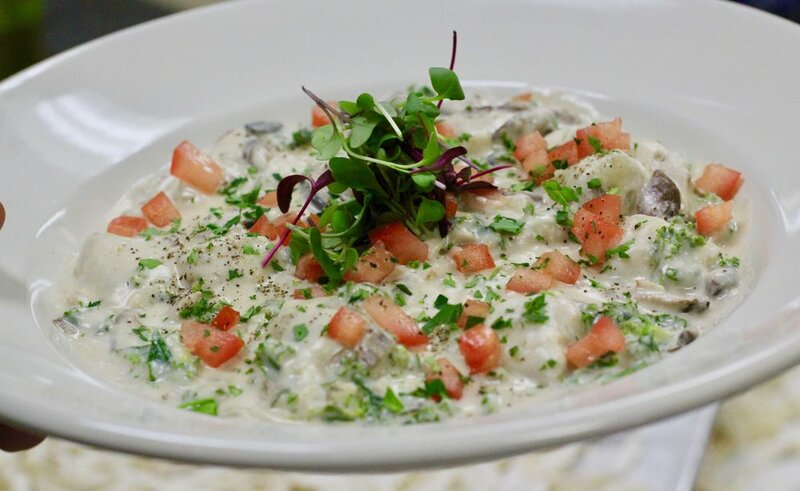 Fresh in-house ravioli pasta, local shiitake and onion, roasted garlic and spinach creme, tomatoes, white truffle oil. Herb breaded tofu filets, whipped garlic mashed potatoes, white wine butter sauce, capers, olives, tomatoes, fresh herbs. Braised short-rib mushrooms, whipped garlic mashed potatoes, crispy onions, roasted seasonal vegetables, creamy green peppercorn jus. Lions mane mushroom filet, tarragon béarnaise, champagne glazed tomatoes, whipped garlic mashed potatoes, seasonal vegetables, crispy parsnips. In-house brioche dough, fried fresh to order, powdered sugar, vanilla whip cream, strawberry compote. Lavender chocolate custard bruleed, anglaise, strawberry gastrique. All of our ingredients have been sourced to ensure everything is 100% plant based. If you have an allergy, please consider the risk of cross-contamination when choosing to dine with us. Nuts, gluten, and soy are used in our kitchen. Please inform your server of any allergies. Gluten-Free options are available upon request for an additional charge. We respectfully decline substitutions to our menu. animal by-products during the production process. We currently do not accept reservations at this time. If you have a party larger than 8 please give us a call and let us know the date and time and we will accommodate as best as we can. Our trained staff is ready to serve you. We can setup free catering consultations, schedule tastings, or begin planning your next event! Gift cards are available to purchase during regular business hours for any amount. If you reside out of town and would like us to mail you a gift card, please send your information to us via our contact page. Please include name, address, amount, credit card information (Visa & MC are accepted), and your phone number. A $2.00 service charge will be added to the total amount. If you have any additional questions, please contact us at 385-267-1922.